Twenty-seven-year-old entrepreneur TJ Parker wants to bring Zappos-style customer service to your medicine cabinet. As a youngster working in the New Hampshire pharmacy that his family owns and operates, Parker developed empathy for people who must take multiple pills, supplements, and other medicines every day. Refill dates never seem to be synchronized, pharmacy check-out lines can be long, and who wants to ask the pharmacist a private question with other customers in earshot? Even worse, medication times are hard to stick to, drugs are easily confused, and bottles can be a hassle to open. For the elderly, very ill, or parents with sick children, daily dosing can be misery. Parker went to pharmacy school bent on figuring out a modern solution to the growing problem. When he found one, he teamed up with Elliot Cohen, 30, a former Microsoft engineer whom he met at a H@cking Medicine event in October 2012. By February 2013, they had won a slot in the Boston startup accelerator TechStars to develop Parker’s business concept. Backed up by $4 million in venture and angel funding, their company PillPack announced its official launch today. Licensed in 31 states so far, they hope to have approvals to serve customers nationwide by summer. 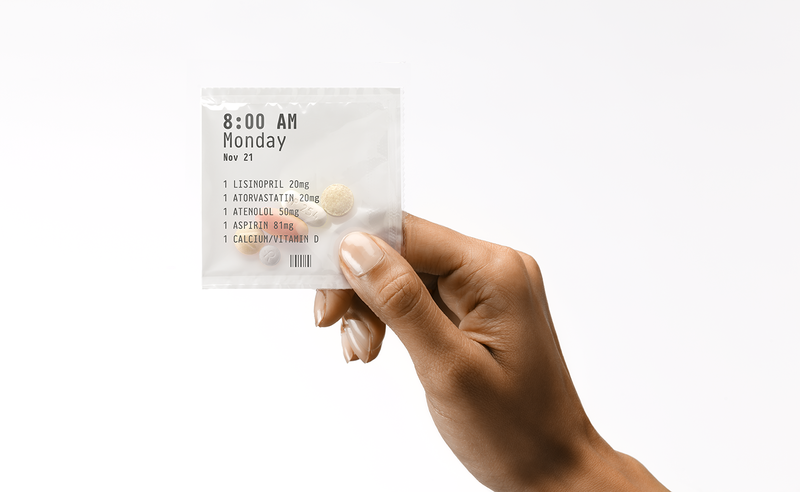 Like other mail-order pharmacies, PillPack accepts most insurance, takes orders online, and delivers medicines directly to subscribers’ homes by UPS. What sets the service apart is that all of a patient’s prescription pills, as well as vitamins, supplements, and other over-the-counter medications come grouped in individual packets marked with the date and time they should be taken. A new roll of tear-off packets is delivered every two weeks. To start, Parker says his target customers are the 30 million Americans who take more than 5 prescription pills a day. “That’s a much broader swath of the population than you’d expect,” he says. “We have patients as old as 88 and as young as 12 in the system.” With PillPack pouches, the mother of the 12-year-old can send her daughter to school or to a friend’s house and “not worry about someone messing up her meds,” Parker says. Adult users can slip a packet in a pocket on the way out the door in the morning, throw a week’s worth of packets in a suitcase for travel, or place one in a purse to take while dining out. Dated and time-stamped labels save those with failing memories from needing to recall whether they took their pills this morning. Parker’s simple packaging system is made possible by high-tech machinery, a detailed design process, and a user-friendly website. In a highly automated drug distribution center that was built in Manchester, NH, for the startup from the ground up, a dispensing robot sorts, seals, and prints packets. A quality control system takes a picture of each and verifies the contents by size, shape, color, and density. Bar-codes, calibrated canisters, and live pharmacists at multiple check-points also ensure against errors. PillPack’s web portal is designed to make it easy for patients to manage their accounts and see when medicines are coming, but the company&apos;s pharmacists are also available by phone and email. A $20 monthly fee, regardless of how many medications are delivered, covers shipping as well as 24/7 service from a team that handles transferring prescriptions from a customer’s existing pharmacy, contacting physicians for renewals, and interacting with insurers for payments. In states where Medicaid covers weekly expenses for a nurse to distribute pills to patients, Parker expects the $20 PillPack fee could also eventually be covered.